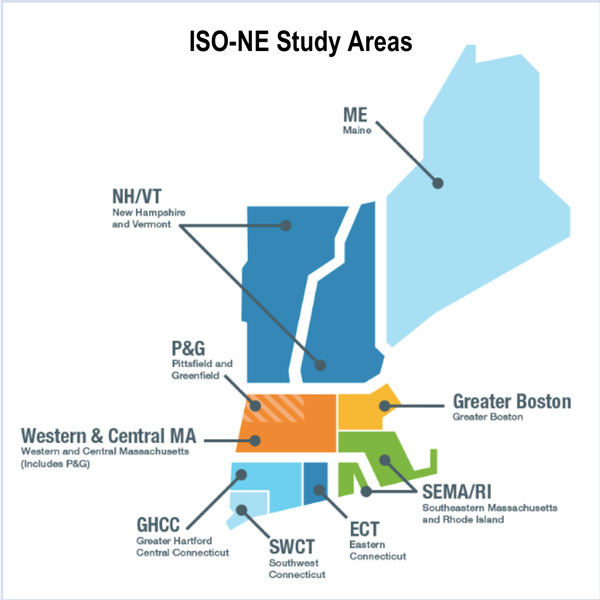 New England will see its grid integrate more renewable resources and increase its reliance on natural gas-fired generation over the coming decade, according to ISO-NE’s 2017 Regional System Plan. With growing penetration of solar and energy-efficiency resources, the forecast shows the 10-year net energy for load decreasing from 126,786 GWh in 2017 to 119,680 GWh in 2026, a decline of 0.6% per year. The 50/50 net summer peak forecast of 26,482 MW for 2017 declines to 26,310 MW for 2026. The 90/10 net summer peak forecast, which captures extreme heat waves, is 28,865 MW for 2017 and grows by 0.1% per year to 29,021 MW in 2026. Retirements will likely be the key driver for new resources. From 2010 to summer 2020, power plant retirements will total approximately 4,800 MW, said the report, which notes that economic and environmental pressures are putting older oil, coal and nuclear generators at risk. Retiring resources are likely to be replaced by gas, wind and solar resources, resulting in a “hybrid” of renewable and conventional generation, the RTO said. As of April 2017, nearly 13,000 MW of resources had applied to connect to the high-voltage grid, though the interconnection queue historically has had an attrition rate of 68% of the megawatts proposed. 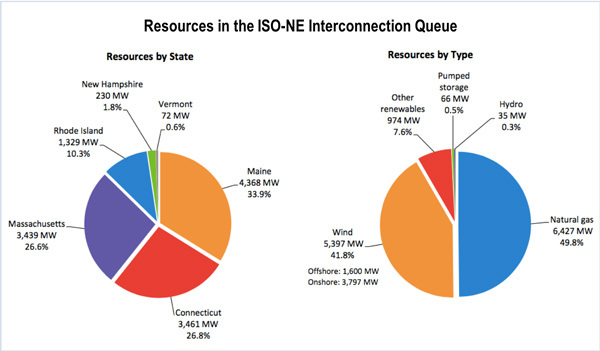 The most reliable and economic siting for new resources remains near load centers in southern New England. The 11th Forward Capacity Auction, held in February 2017, procured sufficient resources to meet resource adequacy criteria through 2021, with about 264 MW of new generation, including 6 MW of wind, 5 MW of solar and 640 MW of new demand-side resources, including 515 MW of energy efficiency. The regional net installed capacity requirement (ICR) is based on gross load and load reductions from behind-the-meter PV. The representative net ICR is expected to grow from 34,300 MW in 2022 to 35,700 MW in 2026, the report said. The report cites fuel security risks from the failure of the natural gas pipeline infrastructure to keep up with the growth in gas-fired generation, a particular concern during winter. Solar PV resources totaled 1,918 MW (nameplate capacity) at the end of 2016. The RTO projects that will more than double to 4,733 MW by 2026, producing about 6.2 GWh of energy that year. PV resources are estimated to reduce summer peak loads by 575 MW this year and by 1,035 MW in 2026. New England has 1,300 MW of installed wind with about 5,400 MW more proposed as of April 2017. Massachusetts in July launched a solicitation for 400 MW in offshore wind, with proposals due in December. The RTO sees the role of energy storage growing over the next decade as the technology’s costs decline. 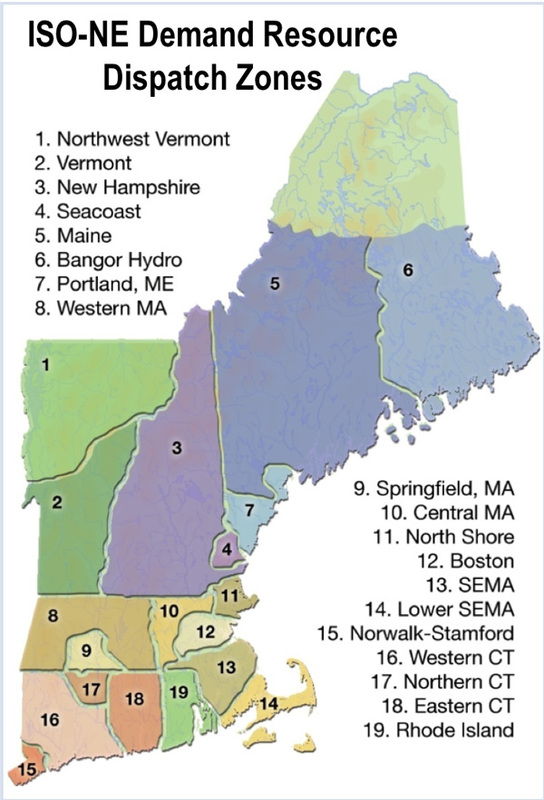 The region’s first grid-scale battery system, a 16-MW facility at Yarmouth Station in Maine, was placed online in 2016. From 2002 and June 2017, the region spent $8.4 billion on 730 transmission upgrades to improve system reliability and reduce congestion. As of June 2017, an additional $4 billion in transmission investment for reliability was planned. The RTO expects the need for major transmission projects for reliability to decline through 2026 but said the integration of large-scale renewable energy resources could change that forecast. ISO-NE's draft Regional System Plan also predicts challenges from generation retirements and integration of variable resources. The installed capacity requirement ISO-NE filed with FERC last week shows a continuing trend of slightly declining load growth and a greater reliance on behind-the-meter solar power.